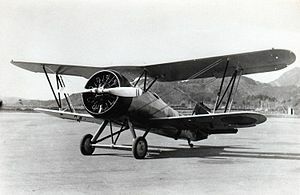 The Nakajima A4N was a carrier-based fighter used by the Imperial Japanese Navy, and the last biplane designed by Nakajima. The first prototype was completed in 1934, but due to engine trouble the aircraft did not see service until 1936. The Japanese Navy designation was Type 95 Carrier-based Fighter. A total of 221 were built.